Today we had the pleasure of hosting a group of Portland State University students from Barbara Brower’s Geography “Farmscapes” class. Each summer Ms. Brower takes a group of her students on an Agricultural tour of the Willamette Valley. This year Hazelnuts were one of the crops they learned about. Rich visited with the students about the history of Hazelnuts in Oregon, our personal history as a family farm and the good, bad and ugly of farming Hazelnuts today. The students asked many intelligent questions and seemed very interested in spite of the very “summer” day we were having. It is heartening to be able to share some farm with urban residents. 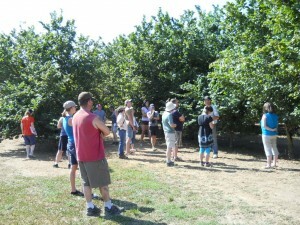 Portland State University students learn about Hazelnut farming. This entry was posted in Hazelnuts, Just For Fun and tagged Fun Stuff. Bookmark the permalink.